What is the most visible country in Africa on Wikipedia? As in earlier posts, what we’re doing here is measuring the aggregate number of views to all articles in each country. In other words, we’re mapping how many people read or view information about any country. So, when looking for the country with the most views in Africa, the answer is - rather unsurprisingly - Egypt. This is a country kept in the public gaze by an important revolution, it’s status as a major business and tourist destination, and the rich vein of documented history about the place. 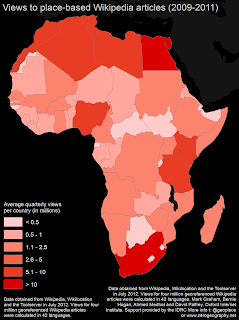 South Africa is next on the list with about 83% of the number of views that Egypt has. Morocco, Algeria, and Nigeria then follow (in that order) with far fewer views then South Africa and Egypt. At the very bottom of the list, we get Lesotho, Central African Republic, Burundi, Gambia, Botswana, and many others that have only about 2-3% of the views that Egypt gets. We are undoubtedly seeing these low scores because there just aren’t that many articles written about Lesotho et. al., but it remains that we can empirically see that the countries at the bottom of the list remain largely invisible to, and for, most Internet users. p.s. also take a look at the map of Wikipedia visibility in Europe. p.p.s. In case, you’re interested, we’re hiring a researcher to help with the statistical analysis of this work.